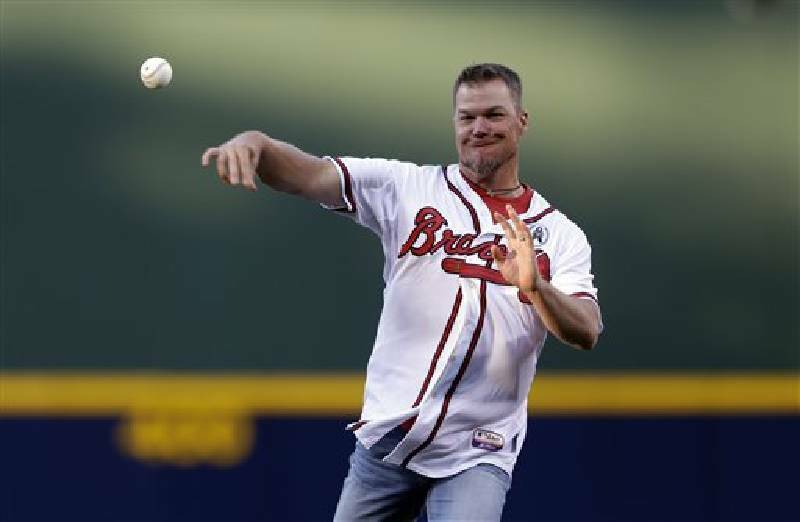 Former Atlanta Braves third baseman Chipper Jones throws out the first pitch for an opening day baseball game between the Braves and the Philadelphia Phillies in Atlanta. Chipper Jones was the first overall selection in the 1990 major league draft by the Atlanta Braves. He made his MLB debut in September 1993 and was The Sporting News Rookie of the Year in 1995. He spent his entire 19-year career with the Braves. When: June 17, 6 p.m. Ticket info: All 2012-13 Best of Preps athletes may reserve complimentary banquet tickets at timesfreepress.com/boprsvp. General-admission tickets cost $50. Seating is first-come, first-served, but a table for eight may be reserved for $400. Tickets are on sale at timesfreepress.com/bestofpreps. Ticket sales will deadline at the door the day of the event unless it sells out before June 17. For more information: Contact Lyndsi Lane at llane@timesfreepress.com or 423-757-6498. Chipper Jones, one of the most popular players in Atlanta Braves franchise history and one of the most nationally recognized professional athletes of all time, will be the featured speaker at this year's Times Free Press Best of Preps banquet June 17 at the Chattanooga Convention Center. Jones was the first overall pick in the 1990 major league draft and spent his entire professional career with the Braves. In 19 years with the big-league team, he helped Atlanta reach the playoffs 14 times, including three World Series appearances and the 1995 world championship. He was an eight-time All-Star selection before retiring after last season and is considered a likely first-ballot Hall of Fame inductee when he becomes eligible in four years. On June 28, Jones' number 10 jersey will be retired by the Braves and he will be inducted into the team's Hall of Fame. "We are excited to bring a baseball legend of this magnitude to Best of Preps," said Jason Taylor, president and general manager of the Times Free Press. "Chipper Jones is a household name in our area and has been one of the top requested speakers by attendees and honorees for years. With our annual event occurring right in the middle of baseball season, we thought it was next to impossible to make this a reality for our readers. His impressive career and loyalty to his program is inspiring." All 2012-13 Best of Preps athletes may reserve complimentary banquet tickets at timesfreepress.com/boprsvp. Athletes will not have assigned seating and may sit with family or friends. The event is open to the public, and general-admission tickets cost $50. General admission includes dinner and the awards ceremony, and seating is first-come, first-served. A table of eight may be reserved for $400. Reserved tables include eight tickets, dinner, awards ceremony, table signage and priority seating with closer proximity to the speaker. Tickets are on sale now at timesfreepress.com/bestofpreps. Tickets will be available at the door the day of the event unless it sells out before June 17. Anyone with questions can contact Lyndsi Lane at llane@timesfreepress.com or 423-757-6498. Doors will open at 6 p.m. and the banquet will begin at 6:30. Jones is the first professional baseball player to speak at the annual banquet, which honors more than 500 area athletes. Jones made his major league debut on Sept. 11, 1993, as the youngest player in the National League. He spent the entire strike-shortened 1994 season on the disabled list after an ACL injury but returned the following year to win The Sporting News Rookie of the Year award and help the Braves win the World Series in six games against Cleveland. He helped lead the Braves back to the World Series the following year, when they lost to the New York Yankees. Jones had the last official hit at Atlanta-Fulton County Stadium before its demolition in 1997. Although initially a shortstop, he spent most of his career as the starting third baseman for the Braves, other than a two-season stint (2002-03) in which he played left field before returning to third base for the rest of his career. Jones was named National League MVP in 1999, won the NL battling title in 2008 and was a two-time Silver Slugger Award winner for third basemen. He is MLB's career RBI leader for third basemen (1,623), holds the Braves' team record for career on-base percentage (.402) and is third on the franchise's all-time home run list (468). He ranks second all-time for most RBIs for a switch-hitter, behind only Hall of Famer Eddie Murray, and is the only switch hitter in MLB history to have a .300-plus career batting average (.303) and 400-plus home runs. He also is one of only two switch hitters in history to hit better than .300 from both sides of the plate. In the final at-bat of his career, in last year's NL wild-card playoff, Jones had a two-out single. Also an avid hunter, Jones was a co-owner of Outdoor Channel's hunting show "Buck Commander" along with reality TV star Willie Robertson of "Duck Dynasty."